Clean solar panels can increase your power performance by over 30% in some cases. 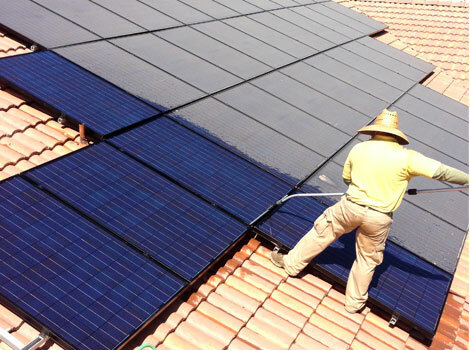 Our mission is to help you keep your solar panels producing the maximum amount of energy by scheduling you for a quarterly cleaning by our highly trained and skilled technicians. Your solar panels become dirty from an array of airborne particles, some of these include sand, bird droppings and tree leaves. It is important to clean after rain and wind as these two elements together create extremely dirty panels. According to National Renewable Energy Laboratory, this debris can cause a loss of up to 30% of solar panel energy production. The U.S. Department of Energy recommends 16 hours of maintenance annually. This number may vary depending on the quantity, type of system and location of your panels.